Part of the joy of doing what we do is knowing we are taking the hassle out of organizing and setting up a sleepover or event. The downside is that our job is done well before the festivities begin so we don't often get to see the moment of "Wow" when the guest of honor sees their setup for the first time. 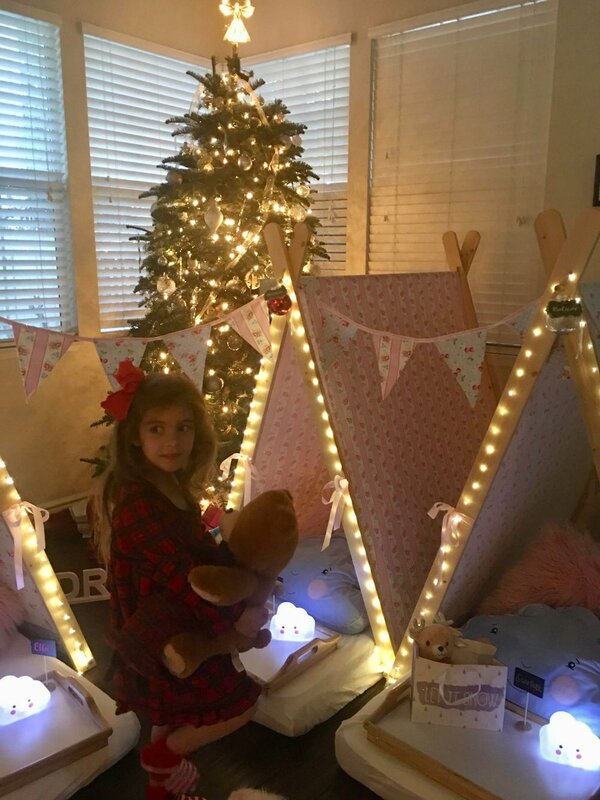 So it was a true joy to share in little Ella's reaction when she saw the set up for her SlumberUnder (our mini-sleepovers for kids not yet ready to spend the night.) 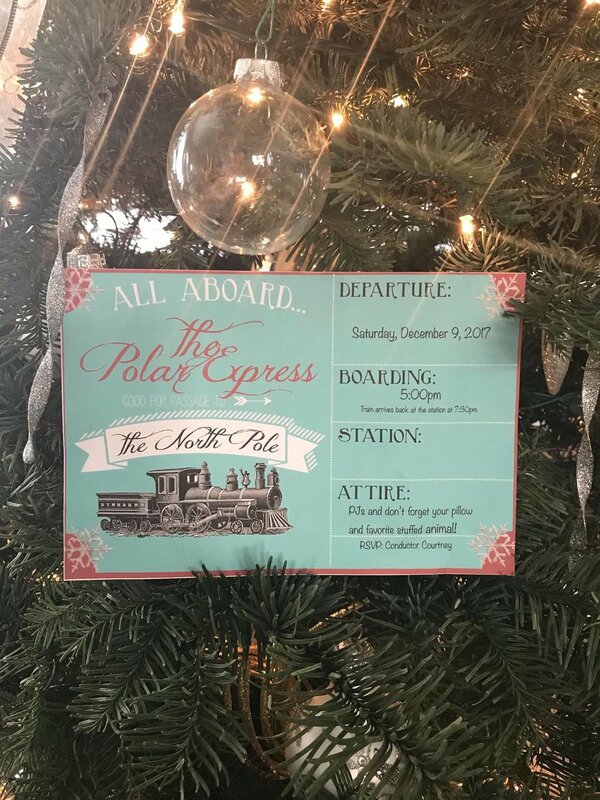 Working with a genius "Polar Express" theme established by Ella's Mom with gorgeous boarding cards and golden tickets we were delighted to help provide a little extra wow. As you'll see Ella LOVED it. Find out how you can bring the wonder of a SlumberUnder to your home here. If you're hosting a New Year's Eve party no doubt you are already feeling the pressure to make it THE GREATEST NEW YEAR'S EVE PARTY IN THE HISTORY OF PARTIES!!!!! And while your mind may be filled with fountains of endlessly flowing champagne, the world's greatest fireworks display and well, basically pure extravagance, chances are you're just like the rest of us mere mortals and have a budget to stick to and reality to adhere to. So here are a few of our favorite party tips that will make sure your New Year's party goes off with a bang. To help out, we've created a 2017 hit heavy playlist for you to use that builds from soft to dance-mania over the course of 5 hours. It includes the big tracks from 2017 plus some all-time party pleases. All you need to do is load it up and turn it up. And if you have little ones check out Netflix who, for the fourth year running, has just published a slew of videos that offer a "fake" countdown clock to midnight. The genius idea here is that the videos can be played at any time. So your kids can join in on the New Year's Eve festivities and still get to bed on time. This year’s videos include characters from “True and the Rainbow Kingdom,” “Larva,” “Pororo,” “Beat Bugs,” “Word Party,” “Puffin Rock,” “Skylanders Academy,” “All Hail King Julien,” and “Trollhunters.” Just search for "New Year’s Eve Countdown” or “Countdown” to locate these videos or get quick access via the "Kids" row on the Netflix menu. From all of us here at WonderTent Parties we wish you a very Happy New Year and hope 2018 brings you everything you could wish for, and then some. Well, here we are folks, at the end of another year. And that can only mean one thing. Time to get your New Year's Eve on! And the guarantee of a great New Year's is a great playlist. So to help you get the night off to a great start and keep it going, here's a selection of our favorite tunes from the past year plus some all-time party stompers to get everyone moving. This specifically curated playlist starts off with some of the more chilled songs from the year and then ramps up into full-on party mode. With over 5 hours of hits, this playlist will have you seeing in the new year with tunes to keep you dancing into the early hours of 2018. So tune in, turn it up and party like it's 2017. Wow. It's Christmas already? It seems just yesterday it was December 1st, and now we are in the final stretch with Christmas just a few nights away. Which not only dials up the excitement but also dials up the stress; Is your shopping done? Did you remember everyone? Is the food sorted? Do we have enough wrapping paper? So here to help put a bit more Merry in your Christmas are some of our favorite Christmas Tips. If, like us, you got your fresh cut tree early it might be in need of some TLC right about now. To be honest, being Australian we don't have a lot of experience with fresh cut trees - ours are usually unboxed rather than cut down - so this year we are learning the hard way about how to extend the life of your tree. Fresh water we covered off, but we didn't think too much about climate. As the nights got cooler we cranked up the heat forgetting that the tree is placed right near a ducted vent. Also, having it near a window that gets a lot of afternoon sun probbly wasn't a smart move either. But since closing the heat vent next to the tree and dropping some aspirin into the water (yes even Christmas Trees can get a Holiday Headache) has seemed to help it stay lush-er for longer. We're hoping it makes it to New Year, but at this stage if it's still holding the ornaments up on Christmas morning we will call it a Christmas Miracle. Oh well, live and learn. Next year we'll be on the top of our game. Christmas Lists aren't just for presents. Anyone who knows me knows I live on lists, so I always like to have a food prep list for Christmas Day. I like to write down how long each dish takes to make, how long it needs to be in the oven, at what time etc. Be as detailed as you can – write down how long each dish takes to make (including any marinating/refrigerating/baking time) and figure out the order to make your dishes in. Mine looks like a running order with precise times and temperatures from morning through to serving time. It might seem overkill but it helps you feel under control and able to enjoy the down time without worry. It also helps in delegating tasks for the family. There's always that dreaded moment when a friend pops over with a lovely gift for you and you haven't got something to give them in return. Sure, you can blame Amazon for the delay but I find having a few generic gifts on hand helps fill the unexpected void. I recommend having a box of chocolates (Sees Candies is a winner), a lovely scented candle, and maybe a fun decoration or snowglobe pre-wrapped and ready on hand. And should you not need them, well then you get to enjoy unwrapping a few extra gifts come Christmas morning. Of course, you can always save them for next year. The last thing you want is for your kids to unwrap the present they asked Santa for only to discover those three words that strike fear into the heart of every parent... "Batteries Not Included!!!!" So always keep a stash of batteries on hand, espcially AA and D.
Fill your ice trays. I repeat, Fill Your Ice Trays. Sometimes the little things make the big difference and having ice on hand for drinks will make things run a little smoother and keep everyone in good "cheers." So, go check your ice trays now... I'll wait. Oh and chill your drinks early. A well-crafted, non-stop Christmas Playlist is a must. Thankfully, we've got you covered with our Wonder-ful & Happy Holidays playlist on Spotify. Tune in and turn it up to fill your home with Holiday Hits for the whole family. Perfect for present wrapping, Christmas morning or just playing throughout the day. As perfect as we want the Holidays to be not all things will go to plan. As sure as Santa loves milk and cookies you can be guaranteed something will go wrong. The trick is to plan for it - or rather plan to roll with it. How you deal with the little upsets of the day will go a long way with keeping things festive and cheerful. The most important thing is the people you share the day with, so aim for special and memorable not perfect. Christmas Day will be hectic enough, especially if you're hosting. So why not set the table the night before when the pressure is off. You'll have ample time to arrange things just so and you won't have a gazillion-and-one other things to do. Trust me, TIME is the gift you give to yourself. So there you have it. A few of my favorite Christmas Survival Tips. Hopefully they come in handy to make your Christmas a special and memorable one. And from me and the team at WonderTent Parties we wish you and yours a Very Merry Christmas and Happy Holidays. 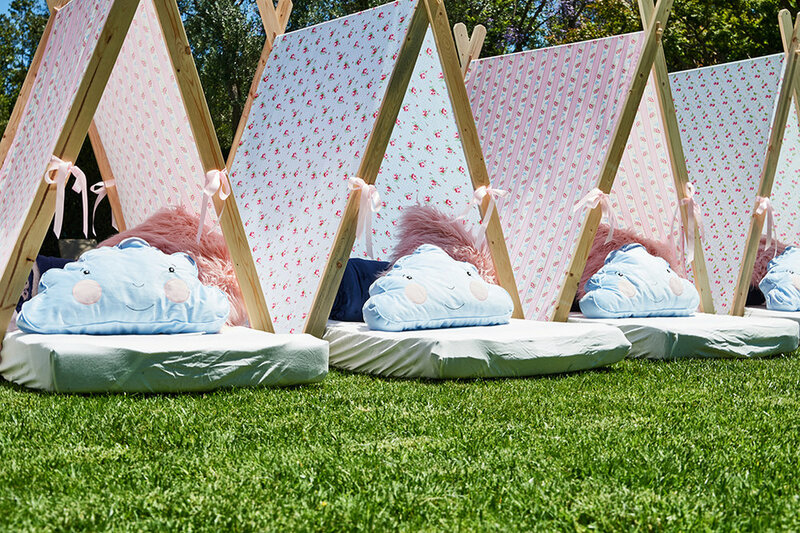 So it's been 6 months since we launched WonderTent Parties and I wanted to share some of our favourite events that we've helped create for families throughout LA. It's been a fun time for us as we listened to the feedback we've received, made some tweaks to make experiences even better and introduced a range of new themes and continued to spread the wonder. In the past 6 months we've done countless events and enjoyed bringing a bit of wow to the celebrations. We've done GlampIn Day Parties for 60, SleepOvers for 20, helped brings a sense of wow to Thanksgiving, and made several birthdays extra memorable. Thank you to everyone who has trusted us to make your events truly special and everyone who has supported and followed us on Instagram, Facebook and Twitter. We look forward to making the next 6 months and beyond even more magical and special. 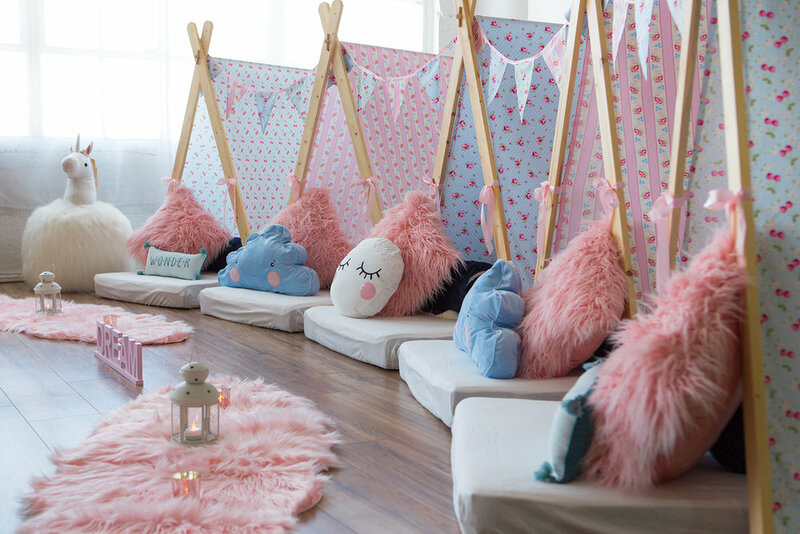 So to celebrate here's a selection of 5 of our favourites that we've created..
Our very first event was a GlampIn Day Party for the end of year graduation for a Pre-School class. We had 12 WonderTents for the kids to play (and nap) in plus the WonderDome was the center of all the action with games held inside. With 20 kids and 40+ parents in attendance we kept them entertained with Karaoke singalongs - songs from Frozen and The Beatles proved very popular - classic games of Musical Chairs, Egg and Spoon Races and a Crafts Station. We also had our popcorn cart on hand as well as ice cream and hot dogs! There's nothing quite like having your first sleepover as part of your birthday. That's what made this one so special. With friends in tow, the girls enjoyed a fun night of games, movies and yummy food. 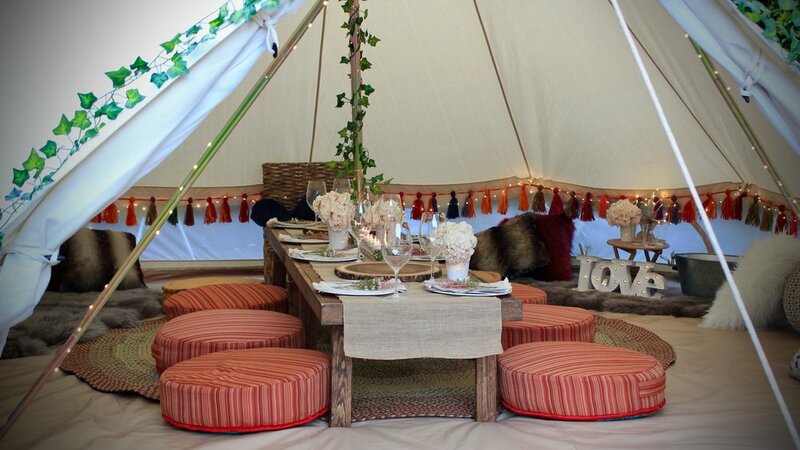 And of course all the magic that comes along with a SleepOver in our WonderTents. The girls loved their personalised overnight packs and their dinner/breakfast trays came in handy at meal times and during the movies. Rumour has it, this will become an annual event. We can't wait. We loved celebrating this special 10th birthday for two very special kids we nicknamed the "Wonder Twins." With his and her WonderDomes and our Outdoor Movie Experience, the birthday boy and girl enjoyed a magical night with their friends. Not a bad way to bring in being in double digits. Can You Do A Sleep Over for 20? Yes, Yes We Can. Our standard SleepOver experience is designed for 5. But of course, we can tailor up or down depending on needs. 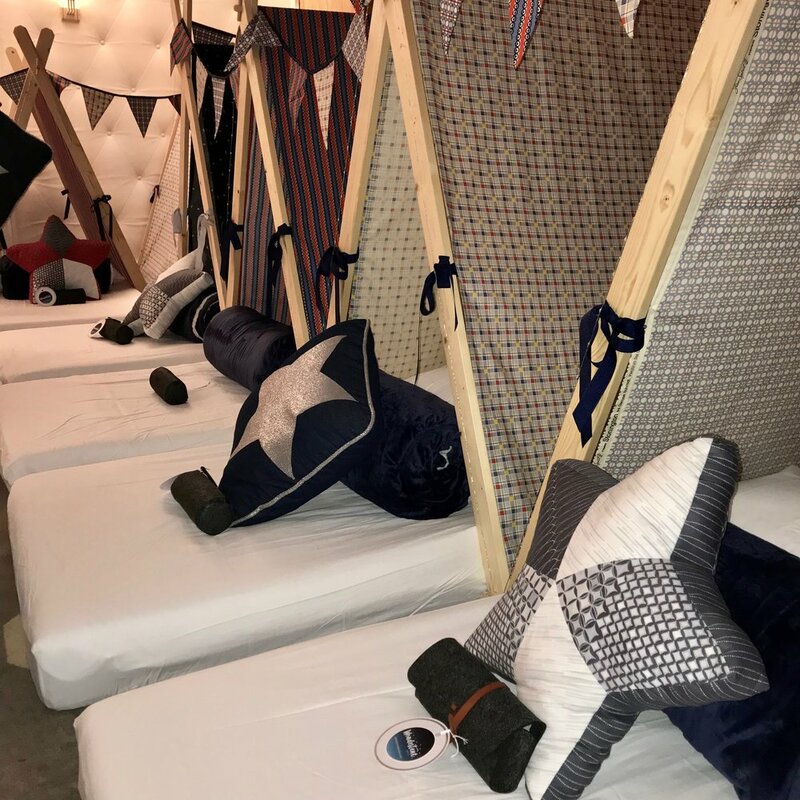 This was a relief to hear when we were asked to create a Sleep Over for 20 to celebrate the important milestone of a Bar Mitzvah. As we say, if you have the space we can make anything work. And we were happy to know we made this special day extra special. We love doing things outside the box, so when we were asked if we could help celebrate a 34th Birthday with double WonderDomes AND our dining experience we jumped at the chance. 10 guests got to enjoy a wonderous night of fun and laughter and we were happy to help make this a birthday not to forget. That's just the tip of Wonder-berg. We can't wait to spread a little (more) wonder over the coming months and years. If you'd like us to help organise a magical event for your child, your family, or you and your friends, drop us a line or make a booking. We promise a wonderful experience. WonderTent Parties has Hamilton on the run. 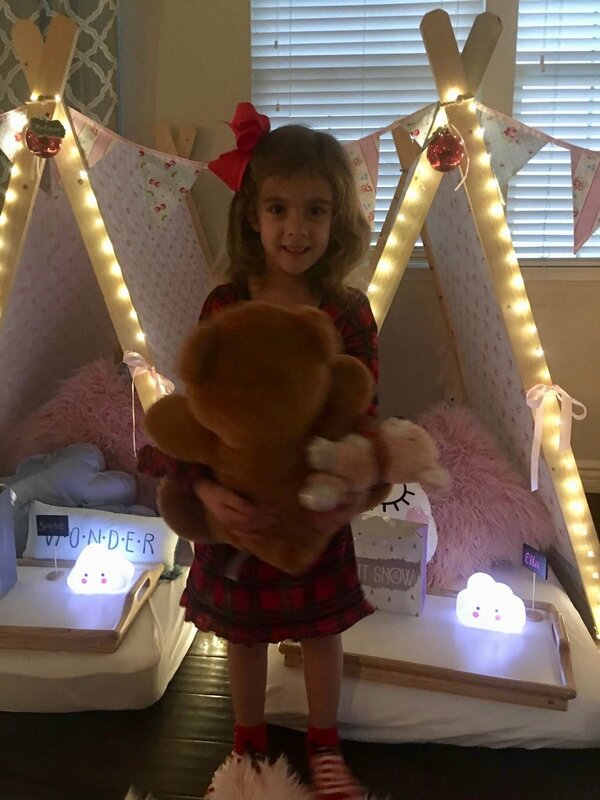 We love knowing the effort we put into making every WonderTent Parties SleepOver special pays off (for both Mom and child.) 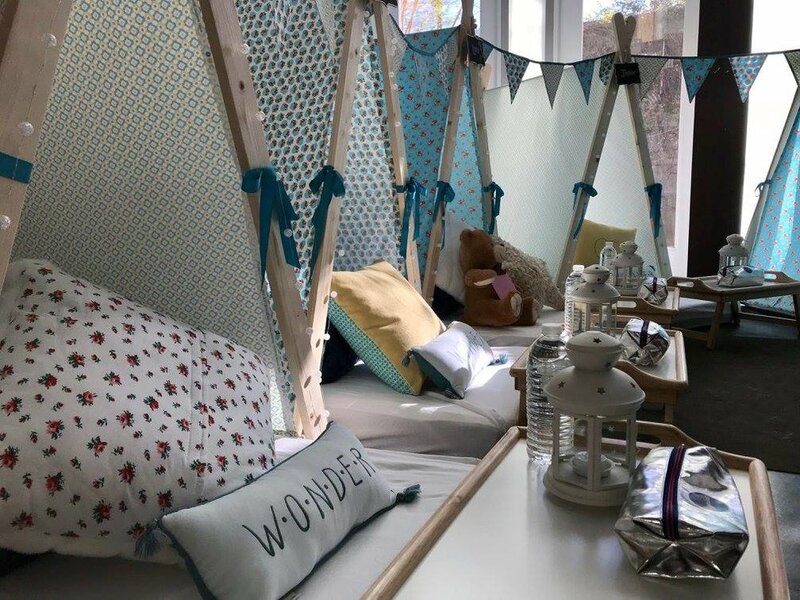 So we were super pleased to read this blog post "Turning Ten Under A WonderTent" on Mommy In Los Angeles from one of our Moms. Helping Lyra and her friends enjoy a magical first sleepover and celebrate her 10th birthday was a joy. We are so glad she loved it. And to know Lyra was just as excited for her WonderTent Parties Sleep Over as she was going to see "Hamilton," well, to quote the musical, "That would be enough". Read the blog post here at Mommy In Los Angeles. Who says you have to age gracefully? How to avoid "Boy Boredom" at your son's next sleepover. Last month, we focused on how to avoid the dreaded "what next?" at a girl's sleepover. Today, we've got some fun tips for the boys. When it comes to getting the gang together nothing spells fun in the making like a sleepover for your son and his friends. Whether it's a birthday celebration, a summer kick-off sleepover, or a weekend hang, the following activities will keep them entertained and away from the dreaded "Boy Boredom Zone". One of the best ways to get the boys having fun and interacting with each other is to have them concoct their own feast. Get them making their own pizza, create to-die-for hotdogs, or challenge them to a competition to see who makes the best burger. Simply provide all the ingredients and let them unleash their culinary creativity. Things may get a little messy, but that's all part of the fun. It's also a great way to make sure they eat! Release Their Inner Ninja Warrior. One of the cool things a Mom recently did at a birthday party that we loved was creating a Ninja Warrior course in her house. Don't worry, it wasn't overly complex but it kept the kids entertained. Using a hallway, string across some streamers in a criss-cross "laser" pattern from one wall to the other. The boys then have to twist, turn, hop and crawl to get from one end of the hall to the other in the quickest amount of time without hitting the "lasers." Another idea is to create an obstacle course with balloons creating the track. The boys then have to dart through the course hitting every balloon in the quickest amount of time. Give the boys a bit of target practice by setting up paper plate and paper cup targets (each with their own score) at one end of a long table. Using either Rubberbands or Nerf Guns each boy tries to rack up the highest score. Before the boys arrive hide some candy or small prizes (glow in the dark items rock!) around the house or backyard. Then when it gets dark (or turn off the lights) give each boy a flashlight and let the hunt begin. Great indoors or out, this fun "treasure hunt" is a fun way to get them active and focused. Give each child their own paper bag to collect what they find. And since they have flashlights, why not set up a game of "Flashlight Tag". It works like this. One child is chosen "It" and is given a flashlight. They count to 100 while everyone hides, and then commences to try and find the other boys. When he finds one, he flashes the light on them. That boy is then "It" and now counts to 50 while the boys try to find new hiding places. It’s always a great idea to have a few board games on hand to focus their energy (and give you a little reprieve). Everything from quick games like Uno or Jenga to marathon efforts like Monopoly will keep the boys occupied. Most boys will gravitate towards playing video games. Don't be afraid to let them spend some time in front of the XBox, Nintendo Switch or PlayStation. Just make sure the games are inclusive and/or team-oriented. Fan faves like Mario Kart, NBA Jam, or Madden can let the boys play set games and swap in and out with ease. Just be sure to set a time limit on gameplay or it can go on all night. The boys might want to get outside for some fun, whether it's shooting hoops in a game of HORSE or throwing a ball around. Another fun activity is a twist on 'Capture the Flag' with a bit of Silly String Wars. All you need are some cardboard boxes, duct tape and some silly string. Divide the boys into two teams, give them the boxes and tape and half an hour to build their own fort. Then give the boys each a can of silly string, sound the trumpets and let the battle begin. Whichever team captures the flag and makes it back wins. Of course, the classic Sleepover & Movie Combo is always a hit. Have the boys decide on a suitable theme before the big day and select two or three hit movies that fit. On the night, let the boys decide which one to watch. Add to the fun, with our Outdoor Movie Experience which gives you all the movie fun in your backyard complete with our Popcorn Cart. Add some snacks with our Candy Bar for goodies to munch on during the movie. Don't forget to have an intermission halfway through for toilet breaks or to grab a refill of popcorn. Remember the key is to find fun, bonding experiences for the boys to do. Stay flexible about what you'll do and when, and gauge their enthusiasm to extend some activities or move them onto the next and a fun night will be had by all. Oh and be sure to set a "lights out" time. This is a favourite quote of ours and hope it keeps things looking up for you. Whether celebrating a birthday or just having a “Girls’ Night”, nothing brings a bunch of friends together like a sleepover. But once all the excitement of arriving and picking which WonderTent to sleep under has settled you might hear the dreaded “What now?” being voiced. So to save you (and your child) some angst of what to do during a sleepover here’s a list of activities we've found that keeps the fun moving. Having the girls create their own meal is a fun way to get them interacting and, also, making sure they eat. Get them making their own pizza, create a delicious taco, or concoct a scrumptious sundae. Simply provide all the ingredients to let them make a meal that really tickles their tastebuds. Other crowd pleasers include decorating their own gingerbread people, baking their own batch of cookies, or making their own cupcakes. To make it extra fun, have the girls come up with a name for their fantastic creation and award prizes for the most inventive, most creative, and yummiest. Arts and crafts never fail but take it up a notch by having the girls create their own friendship bands or decorate their own pillowcase. We’ve found styling their own pillowcases is a big hit as not only is it a nice tie in with the sleepover experience it also makes for a nice keepsake. Having the girls autograph each other's pillowcases also makes it something they’ll treasure forever. Make it a Spa-jama Party. Who doesn’t love to be pampered? Let the girls style each other’s hair with colorful ties and bows, paint each other’s nails or enjoy mini-facials. Be sure to take before and after photos for when the makeover is complete. On a recent Sleep Over, one of our Mom’s created a fun scavenger hunt for all the girls to do. It was a great way for the girls to safely explore the neighborhood as well as burn off that tween energy. Of course, it’s just as fun darting throughout the house to find the next clue or prize. The main thing to remember is to make the clues just hard enough that it makes them think and feel good about solving the puzzle. It’s always a great idea to have a few board games on hand to focus the energy (and give you a little reprieve). Everything from quick games like Uno or Jenga to marathon efforts like Game of Life or Monopoly can have the girls chatting and laughing in no time. Our personal faves are Guesstures and Sequence, or for the app enabled tween, Heads Up is always a crowd pleaser. Turn up the tunes and make some room for the girls to bust a move. Have each girl teach the others a signature move or the latest dance. And if a gaming console is close by loading up Just Dance will guarantee hours of enjoyment (not to mention great video opportunity.) For added Diva-ness bring out a karaoke machine and let them channel their inner Ri-Ri, Sia or Taylor. Of course, who can go past the classic Sleepover & Movie Combo? Have a theme selected with two or three hit movies that fit and let the girls decide which one to watch. Add to the fun with one of our Popcorn Carts, and give each girl their own popcorn cartons and snack trays filled with goodies to munch on during the movie. Don't forget to have an intermission halfway through for toilet breaks or to grab a refill of popcorn. Whatever activities you decide, the goal is to have fun. Have the girls shrug off any self-consciousness by making sure everyone is involved and cheered on. It's ok to have a schedule of activities (in fact, I think it's a great idea but then I'm a planner) but build in flexibility to let some activities run long or others wrap up sooner if you feel their enthusiasm waning. And remember to have fun yourself and you'll soon be making magical memories in no time. Remember the feeling you used to have when you had a sleepover with friends? We've taken it up a level with our Sleep Over experience. We think this captures it nicely.